Big budget or not, CISOs must make threat intelligence a priority and learn how to focus on only the data that matters—data that will help mitigate future risks. Though the technical definition of threat intelligence may change depending on who you ask, one factor remains constant: If threat intelligence isn’t part of your cyber resilience strategy in some capacity, you have a massive gap on your hands. And you may be blindsided by a phishing attack, malware incident or worse. 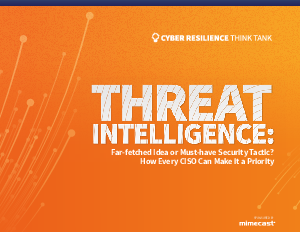 Read this Cyber Resilience Think Tank executive strategy guide to develop a plan to architect a threat intelligence program in your organization.